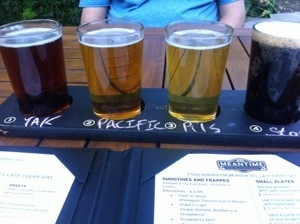 I didn’t expect to get seated at the meantime brewery. After all it was sunny bank holiday evening, not far from the Thames, and getting seating has definitely been a problem in the past, but I wonder of the novelty’s worn off…. there was the odd available table. There were other changes. I have to report that the overpriced pub grub menu has been upgraded. Unfortunately we’d already eaten at the market, so this is a non-sampled menu review. (I know- shouldn’t be allowed, but somehow I feel I can still provide enlightenment). Significant improvements seemed to include proper bar snacks along with recommended matching beers: real pub food with matching beers. There was a very small dessert menu, but if simplicity yields perfection I’m all good with that (plus, it makes decisions easier). This is all more pleasant than the days that we would pop in for a drink, struggle for a seat and order rounds of over-priced bread to accompany our meantime lagers until they ran out (of the bread not the lager). The strength of meantime is it’s authenticity. 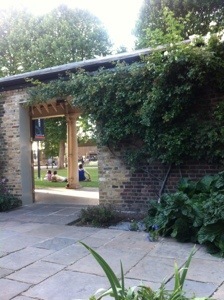 It is an own brewery packed into a Greenwich house in the gardens of the old naval hospital, Greenwich university, very near the Thames, with climbing roses (that always make me sneeze) in the redbrick circling walls. 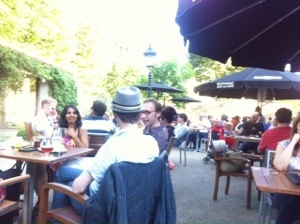 Why would you spend a summer evening anywhere else? That said, it is a genuine pub. You have to battle elbows and assert yourself at the bar. I’m sure I’m too old for this cold stare; I was here first; he’s been waiting for fifteen minutes palava.